Arrogance, failing to act, capital investment apathy, willful ignorance, and management/operational issues are just a small sample of the common root causes of business performance failures. Business Turnaround situations require facing these facts and developing a flexible strategy to address plausible scenarios and business conditions. The following case study outlines the benefits of combining different strategy development methods, such as SWOT and Scenario planning to achieve a business turnaround. 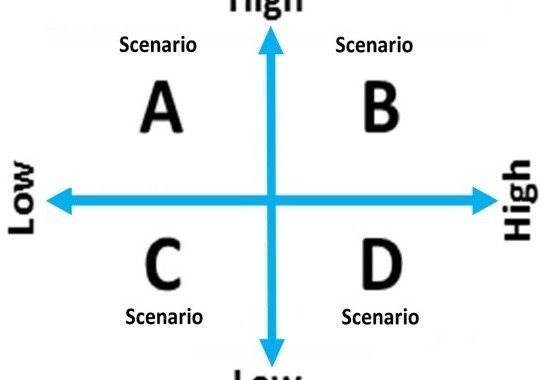 Strategy scenarios allow an organization to easily respond to changes and transition between necessary actions during the turnaround execution. After years of declining product volumes, highly publicized recalls and rounds of workforce reductions, our client’s manufacturing plant had been officially put up for sale. Our client’s plant was tasked with developing and evaluating plans to either 1) shut the plant down, 2) sell the facility and/or 3) turnaround the site. While the plant continued to operate at 40-50% capacity, the local leadership team was tasked with developing these options and preparing the financial case for each. It became very clear, that a turnaround strategy could be the best option but developing a clear strategy and refining it each year would require additional outside assistance. WGA’s Consulting Team developed a tailored and collaborative scenarios strategy and planning process. This process focused on including all levels of the site in the development of the five year turnaround strategy. Broken into multiple off-site workshop sessions, WGA led the site through a process of identifying the site’s strengths, weaknesses, threats and opportunities. Subsequently, WGA developed scenarios strategy to refine the Business Transformation. We then worked with the client’s regional leadership team to determine outside perceptions of the site and to identify the root causes of the sites weaknesses. Next, WGA worked with the site to evaluate, choose and prioritize the initiatives and identify the timing and benefits of each initiative. WGA worked with the site to form a robust Business Transformation Plan, that outlined meaningful changes and commitments to improve the competitiveness of the site. WGA worked with the local leadership team to develop detailed plans for each scenario strategy and identify resources for each project supporting the Business Transformation Plan. We then worked with to finalize the scenario strategy with regional leadership for approval and commitment. Next, WGA worked with the local leadership and project teams to accelerate the start and execution of each of the projects supporting the strategy. WGA continued to provide regular advisement on the execution and annual refinement of the strategy to accommodate changes in business conditions. Posted in Pharmaceuticals and Medical Products, Simplify Complexity, Strategy, Supply Chain Optimization, Turnaround and tagged Business Performance, business turnaround, strategy scenarios.